Months ago, we had the pleasure of touring Yonder Way Farm and eating the most satisfying meal in a picturesque setting. Just imagine – a perfectly cooked, farm fresh meal, under an oak tree, while gazing at hundreds of stars. Yes friends, there are actually stars outside the city! So, all that to say, when I glanced at that Instagram post, I didn’t think twice. I immediately hopped on those tickets for Joe and I. We were scheduled to drive to Gruene, Texas, for our anniversary weekend, but instead we made a detour and went to hang out at the barn with Jason and Lynsey and be part of their 1st Supper Club. As we woke up in our hotel room at The Grand Fayette Hotel in Fayetteville, we were filled with excitement and anticipation. The day had come for the “1st Supper Club” at Yonder Way Farm. About 5:45 that evening, we drove down the long country backroads to get to our destination. As we entered the Yonder Way Farm property, we were met by a sweet group of young girls who were checking off names of guests as they arrived. Then we kept down the long drive to a one of the back fields to park near a slew of free-range turkeys, pigs, and chickens. We were getting the full farm experience! Joe and I walked quickly to the barn, and outside awaited us a table of fresh hor d’oeuvres. Not trying to invoke envy, but it was a pretty impressive spread. There was cilantro and kale artichoke pesto. Bernhardt Farm provided a beet, jalapeno, and roasted garlic hummus. Large cubes of fresh sourdough bread from Kraftsmen Baking were scattered on large platters. There were handcrafted cheeses from Brazos Valley Cheese. The rich olive oil and balsamic vinegar were from Texas Gold Olive Farm. As we made our way to the tables, more appetizers began to appear on the two long decorated tables. We had Yonder Way Farmbacon-wrapped dates stuffed with almond butter. Bernhardt Farm’s squash boats were stuffed with Yonder Way sausage. 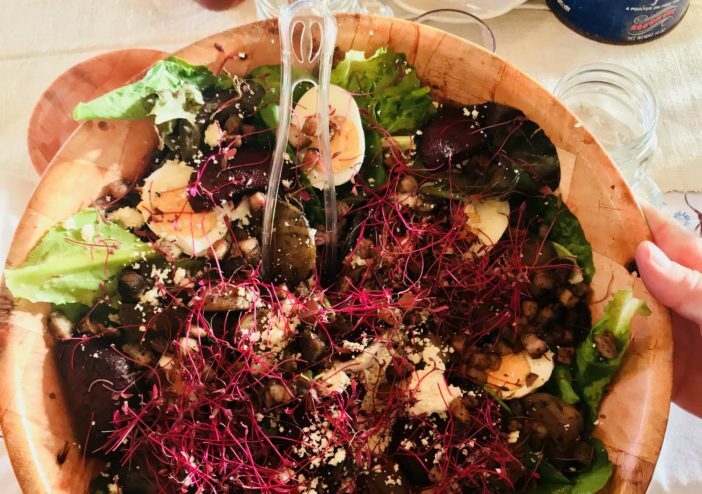 For the salad, we were served beautiful mixed greens topped with roasted red, gold and white beets, Yonder Way Farm’s pork belly and pasteurized eggs, and raw cottage cheese from Stryk Jersey Farm. And hold on…there’s so much more!! They also served a cold cucumber tomato salad with sliced red onion dressed with olive oil and balsamic vinegar. The main course consisted of fire-grilled Yonder Way Farm boneless Berkshire pork loin with a peach brandy glaze. The peaches came straight from Engel Farm. Fire-roasted okra with dill cream sauce, and herbed potato salad were among the delicious sides. And last, but never least, is dessert. What else would they serve on a Texas farm, but none other than a cast iron skillet peach crumble. My mouth is watering again just thinking about this meal! I also have to mention the hospitality. Jason and Lynsey’s four girls and their whole staff were unbelievable. Every time we turned around we were being asked if we wanted a refill of drinks or extra napkins, and it was all hands on deck when serving the food. They made us feel like family sitting around their table. The Kramers really do hospitality right. I want to encourage you all to check out Yonder Way Farm for clean, pasture-raised chicken, pork, and eggs, and grass-fed beef. Y’all be looking out for the details of the next Supper Club. You don’t want to miss it! Do you ever think about where your meat and vegetables come from? Do you know much about the farmer and what he or she feeds their animals? Any idea if they use pesticides of any kind on their vegetables? If you are looking to improve your health, especially your gut and brain, then I strongly encourage you to start looking at your food source. These are the questions I started to ask myself after my mom was diagnosed with Alzheimers and continue to research. 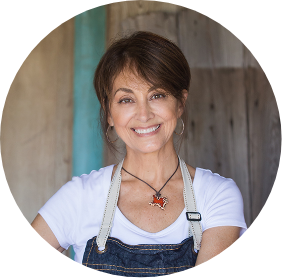 I’ll be sharing tips on what to be looking for and how to get to know your food sources. It’s so important! 5th generation Texan. Rooted in faith. Strong work ethic from childhood. Standing firm on The Promises of God. Blessed to have a wonderful husband who passionately seeks to understand me each day. Thankful for the precious gift of being a momma of three beautiful adult kids who continue to be the joy of my life. Strong work ethic from childhood. Standing firm on The Promises of God. Blessed to have a wonderful husband who passionately seeks to understand me each day. Thankful for the precious gift of being a momma of three beautiful adult kids who continue to be the joy of my life. I'm Servin' the Truth on a Texas-Style Platter! Plus I'll Be Sendin' You My Top 15 Brain-Boosting Foods!